Social recruiting is just one aspect of a multi-channel recruiting strategy, but it’s one you can’t afford to overlook. With more than a billion users on Facebook and 200 million on LinkedIn , social networks are a great way to diversify your recruiting strategy and take advantage of social communities. But social recruiting is about more than just having a Facebook page or tweeting job postings. 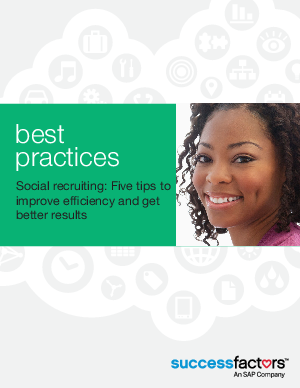 Done well, social recruiting can increase your reach, improve the quality of your hires, and reduce your sourcing costs. Read this white paper for five tips that will make the most of your social recruiting efforts and get better results.